Heavy is the head that wears the crown! Over the course of his now decade long-career, Copywrite has been a lightning rod of controversy, engaged in numerous beefs (some of which have lived out in real time and not just on the microphone). Yet, in life, lessons are learned, you grow and mature; and above all else life has a way of imparting upon you what’s truly important. For Copywrite, the devastation he felt from the loss of close friends and family members has heavily impacted his view of the world and his place in it. Leaders are bestowed a great deal of responsibility and they can influence those around them to do the right things, or they can lead them astray; Copywrite has chosen the former as his path. Following the successes of his debut LP (“The High Exhaulted”) and his most recent sophomore album (“The Life and Times of Peter Nelson”), Copywrite found himself at a crossroad. He had first become popular in the underground scene for his battle raps and witty punch lines. With the release of “Life and Times of Peter Nelson” Copywrite found critical success (XXL Magazine, Hiphopdx.com, Thewellversed.com, URB.com etc) by being more honest and candid about his life. Some fans yearned for the Copywrite who ripped other rappers to shreds; while critics and newer fans appreciated the deeper more introspective side of Copywrite. Mix all of that in along with the deaths of a few close friends and family members that have taken place since “The Life and Times of Peter Nelson” was released a year ago emboldened Copywrite to strengthen himself in his faith to change his content moving forward. What this offers the listener is a true look into the artist, who like many of us, starts something one way, but finishes it in a different manner. 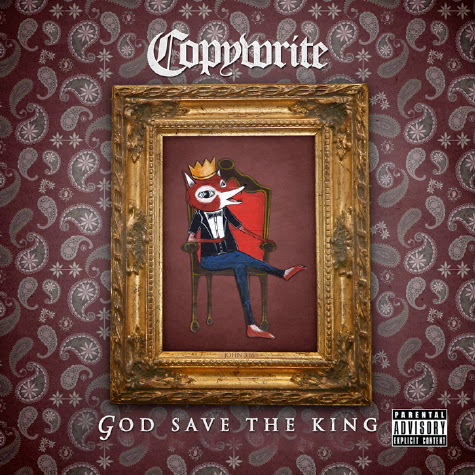 With “God Save the King” Copywrite delivers another brutally honest record that reaches for new creative heights. “God Save The King” will be released on February 28th, 2012. Hit the jump for the album playist.